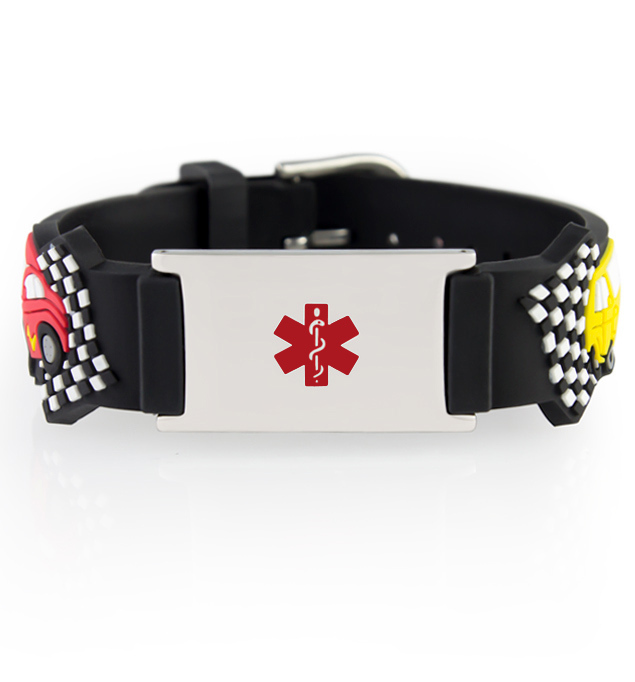 Rev it up with our Cars Medical ID Band! Featuring a special red racecar with a lightning bolt, yellow jeep, blue sedan, and checkered flags, this black silicone medical ID band is an adjustable, durable, water-friendly ID kids love to wear! With a watch-style closure for easy clasping and size adjustments, the Cars Medical ID Band is one that can grow with your child. Opposite the clasp is a medical ID tag with a bright red caduceus symbol, designed to alert first responders to your child’s medical information, engraved on the back. Whether you or your loved ones wear a medical alert bracelet for food allergies (such as peanut, tree nut, soy, or wheat allergies), Type 1 Diabetes, epilepsy, autism, celiac disease, or any other chronic medical condition or treatment consideration, adjustable silicone medical ID bands are a terrific option. Water-safe and on-trend, these durable medical ID bands are easy to adjust and put on, making them ideal for active, growing kids. One size fits most children, wrists sized 4.5” - 6.5”.